What to do with an Aging Computer? While this blog has evolved into a productivity portal of sorts in the last couple of years due to my heavy involvement with GTD, I occasionally feel the urge to stray away to other territory, usually to iPhone apps. This will be one of those posts. For those of us working in a Novell environment at work, GroupWise is a way of life. It’s how we get work and communication done. But this causes challenges for those of us that want to take our GroupWise email and calendar with us on our iPhone. While there are enterprise solutions available, few Novell shops will implement the infrastructure and other resources necessary to support iPhone users. Until recently, the GroupWise WebAccess mobile client was the only client solution available. When compared with the iPhone mail app, it was worse than rudimentary, very small links and many clicks to see your mail or calendar. So most iPhone users just forward their email to their personal account. But this is not a good solution, and is a security nightmare waiting to happen, should a confidential message or one containing privileged information be intercepted as it is sent across the open Internet. Enter Ghost Pattern Software. They began with a simple wrapper with which to use the WebAccess mobile client, and then expanded to provide a couple of really promising apps. I’ll describe each of their apps below. All three are available for a very reasonable price on the app store. This application is much the same as what you would see if you used Safari on the iPhone to visit your WebAccess page, with a couple of important differences. The first is that it provides one click access to WebAccess as it will store your login credentials so there is no need to type them on the small iPhone keyboard. Second, it provides a convenient back button with which to move to the previous screen. This mobile app provides most of the basic, and some not so basic, GroupWise features. The problem with this mobile interface is that its links are small, and it takes too many clicks to reach your destination. You can see some nice screen shots of the app at work at Ghost Pattern Software. 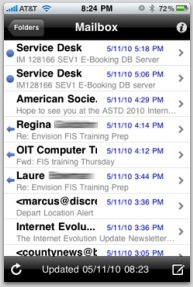 If you like the look of the iPhone mail interface, your going to love this step up from GW Web. This app provides one click access direct to your inbox, and presents your waiting messages in a more readable format. While this app is more lean in features than GW Web, it has been evolving quickly, recently adding access to other folders, adding a link to more than the initial 25 messages displayed, and provides access to message properties and your GroupWise address book for use when composing new messages. This app does crash at times, especially when attempting to access folders in the cabinet, but nonetheless has allowed me to stop forwarding mail to my personal account. I rarely feel the need for features beyond what it currently provides, other than push notifications of arriving mail, which won’t be possible until the arrival of iPhone v4 with multitasking. This app provides one click access direct to your calendar in a day or week format. Again, the presentation of your appointments is done in a more readable format than the GW Web app, and without all the clicks. 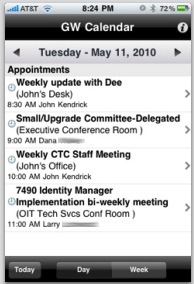 You can even see your notes along with appointments in the day view. And now you can accept or decline appointments right from your iPhone. I love this app and use it all day, frequently checking my calendar when moving from meeting to meeting to make sure I’m headed in the right direction. And just like the GW Mail app, it allows you to see the properties of appointments. So, all in all, some great iPhone apps to keep your GroupWise mail and calendar available while on the go. One caveat is that all three apps need Internet access and a GroupWise WebAccess account. But if you live and work in an area with ubiquitous Internet access via wifi or 3G, you will find these apps a major step forward for productivity on the go, and should give them a try. Did I say productivity? Well yes, I guess this does qualify as a productivity post after all. Let me know your thoughts, and thanks for reading, John. I have all of these apps and really like them. I also got this book, which I found helpful – http://bit.ly/aGQBI9 – the book mentions these apps and a number of other options for iPhone users. Hi John! Thanks for getting the word out on the Ghost Pattern Software GW offerings. Outside of “enterprise” tools, these are my favorite GW apps for my iPhone/iPad (and I knew the developer back when he worked for the GroupWise team at Novell – sometimes it’s just good to support really nice people!). I am the author of the book that DJ mentions. And while you are correct that the guide includes many options that require administrative support, there are a few that don’t. For example, you can use Outlook to sync at the desktop (painful but free if you already own Outlook), MobileMe (http://www.apple.com/mobileme/) to sync over the air (not free, but still somewhat painful) or CompanionLink (http://bit.ly/aTqIYO ) to also sync OTA. So GroupWise users should not despair! There are a number of options depending on your patience level and pocketbook! @Danita – thanks for your update on the book. Based on your comments I went ahead and purchased a copy and look forward to reading about other solutions. Who knows, perhaps it will help me convince our IT management to provide an enterprise solution at some point in the future. Thanks again, and thanks for reading, John. For any GroupWise admins who might be lurking as well, Novell also has a Technology Preview of their upcoming Mobility Pack, which is an ActiveSync server for GroupWise. This allows GroupWise to do over-the-air synchronization of email, contacts and calendars through the “Exchange Account” settings on the iPhone/iPad/iPod Touch. It looks very promising as well, and will not only sychronize iPhones, but just about any phone/device that has ActiveSync capabilities! My brother recommended I may like this web site. He was once totally right. This publish truly made my day. You cann’t imagine simply how much time I had spent for this info! Thanks!